A new piece of art has been added to the Las Vegas Healing Garden. 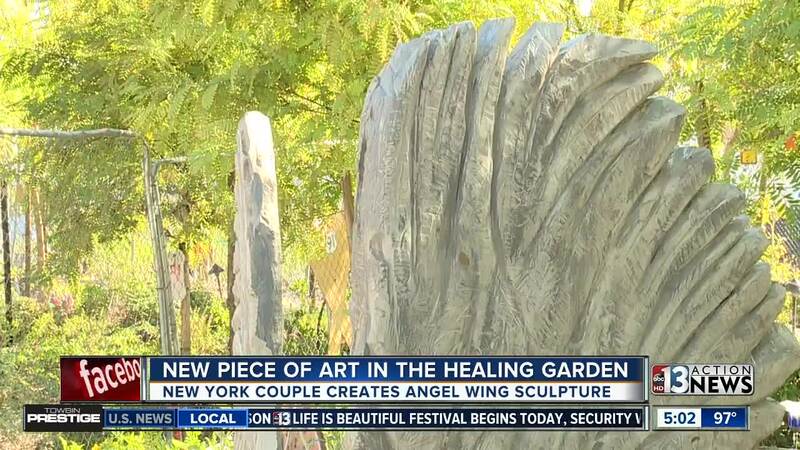 The angel wings sculpture, titled “Love and Courage,” came cross country from New York to honor the 58 people killed in the Las Vegas mass shooting that happened on Oct. 1, 2017. The 6-foot-tall, 3,000-pound piece of art, created by Bobby Jacobs, includes the initials of every victim. Jacobs said it took him about eight months to complete. "The initials were the hardest part. Putting the initials on the back, you know you hear 58 people were murdered," he said. "It's a big number when you hear it, but when you're putting initials one at a time, 58 becomes a very big number." Jacobs and his wife started the Spread Your Wings Project, which provides therapy through art in response to tragedies across the nation.